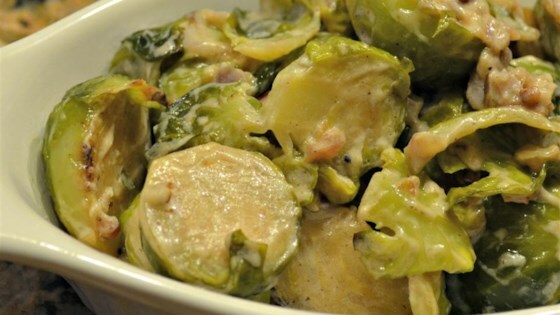 "What to do with Brussels sprouts? It's all in how you season them, and this recipe creates a visually appealing and flavorful side dish to any meal! This recipe also works well when substituting Brussels sprouts with cooked green beans. Mmmmm good!" Heat olive oil in a skillet over medium heat; cook and stir onion until translucent and tender, 2 to 3 minutes. Transfer onion to a large bowl. Place a steamer insert into a saucepan and fill with water to just below the bottom of the steamer. Bring water to a boil. Add Brussels sprouts, cover, and steam until tender, 10 to 15 minutes. Transfer Brussels sprouts to the same bowl with the onion. Stir sour cream, bacon bits, butter, and hot sauce into vegetable mixture until evenly coated; season with salt. This recipe is great; I'm glad I overcame my doubts about how these ingredients would go together. Made it for Thanksgiving as a side and everyone loved it! Delicious! Loved it. I used sriracha as my hot sauce and it worked great. This was okay, but I think I would have preferred it without the sour cream.